In a medium bowl, stir together the mayo, lemon juice, cucumber, radishes, dill, garlic and salt. Cover and refrigerate until serving. In a small bowl, combine the oregano, garlic powder, lemon zest, marjoram, salt and pepper. Rub the pork with the seasoning. Place the pork in a 4 quart slow cooker and add the broth. Cover and cook on low for 9 to 10 hours or on high 4 1/2 to 5 hours. Use tongs or a slotted spoon to transfer the pork to a platter. Use two forks to coarsely shred the pork. Add the lemon juice to the cooking liquid. Drizzle the pork with some of the cooking liquid. Drizzle the pork with some of the cooking liquid. 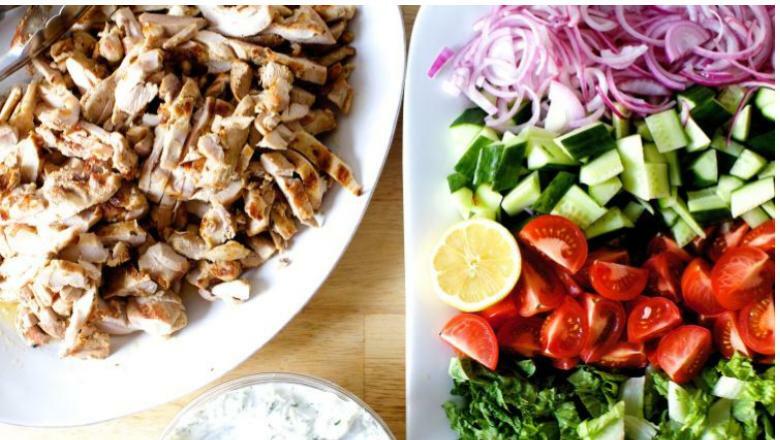 Serve the shredded pork in bowls with piles of cucumber, radishes and onion and drizzle with tzatziki. Serve with lemon wedges and top with fresh dill.